Augustus Funeral Home regrets to announce the passing of Mr. Russell Walter Livingston Knight Sr.
A Home Going service for Mr. Russell Walter Livingston Knight Sr., beloved husband of Mrs. Denise Trew-Knight of #20 Warwick Lane, Warwick WK02 in his 82nd year, beloved father to Charmaine Franks, Vanessa turner, Valisa Knight, Russell Knight Jr. and Racquel Knight also predeceased by wife and mother of children Mrs. Euleta A. Knight, son of the late Ismay Trott and Maxwell Smith, brother to William Steede, Patricia Steede, Gloria Grant [Richard], Nadine Rawlins [Millard], the late Charlotte Steede, will be held at Vernon Temple A.M.E. Church today, August 9, 2018 at 1:00 pm. Flowers may be also sent to 8 Redkiln Road Hamilton Parish Bermuda CR02. Interment will follow the service at St. Peter’s Cemetery. 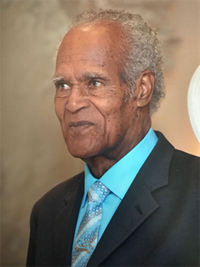 Relatives and friends may pay their last respects at Vernon Temple A.M.E. Church today Thursday, August 9, 2018 from 12:00 pm – 12:50 pm. Lovingly remembered by grandchildren: Charoy Richardson, Chelsea Knight, Mickyle Franks, Raphael Knight-Packwood, Chiamo Knight, Zhane’ Turner, Arielle McMillin, Chazz Knight and Rajee’ Knight-Rowling; great grandchildren: Chakwi Richardson, Sakia Richardson, Gi-Yani Knight-Smith, Mihlan Robinson; sisters-in-law: Veronica Todd, Judith Swan, Jenneth Woods, and Herlyn J. Blackwell [N.J.]; brothers-in-law: Albert Williams [N.C.], Arnold Todd Jr., Ronald Brown [USA], Clement Brown Jr. [USA], and Robert Brown Sr. [USA]; numerous other relatives and friends.